High Wycombe often experiences high levels of UV rays during the hotter months of the year. By installing one of Sail City's award winning shade sails you can protect yourself and your family from the harmful UV rays while still enjoying the warmer weather. 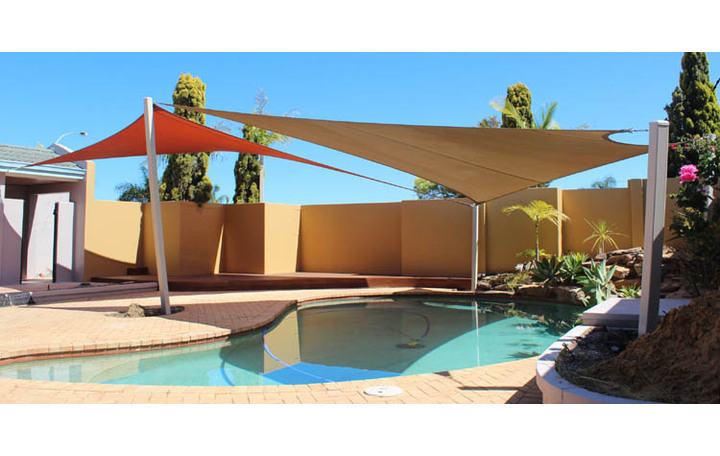 Sail City Shade Sails manufactures and installs shade sails over a variety of areas such as, carports, pools, playgrounds, courtyards, balconies, domestic and commercial areas in High Wycombe. These shade sails offer an attractive and affordable addition to both domestic and commercial areas, providing a solution to creating shade over an area, allowing it to be utilised to its fullest potential. Established in 2003 Sail City has been awarded multiple times for its designs by the Specialised Textiles Association National Awards for Excellence. This ensures that your shade sail will be one of the best shade sails around. The quality of each shade sail is guaranteed by custom designing each shade sail to fit the unique application it will undertake. By using 3D CAD engineering software and laser technology to cut the sails to size, Sail City increases the accuracy and minimises the waste when manufacturing each sail. Along with high tech manufacturing techniques Sail City uses high quality fabrics with the maximum UV protection backed by a 10 year proportional warranty. Shade Sails can also provide a privacy barrier when a relatively non-transparent fabric is used and the sail is mounted correctly so that will create a visual and sound barrier. One shade sail Sail City has installed was used to both protect plants along a fence line and provide additional privacy as it was mounted between the fence and roof of the home. Protection from UV rays in the summer is important for all people but especially for children who are often not even aware of the present dangers excessive UV exposure can cause. Shade sails positioned over playgrounds in High Wycombe can create a far safer environment for children to play in during the day when the UV rays are at their highest. Sail City has installed many playground shade sails often using the hyper shape. The hyper shape is a position the shade sail is set to that is the most aerodynamically stable position, limiting movement of the sail even in high winds. This will prolong the life of the sail as it will limit any wear from movement cause by wind. Our partners at Retractable Fly Screens offer high quality retractable fly screens for High Wycombe which are important additions to a home or business for protection against unwanted insects from entering inside a building. We also sell high quality shade sails parts in Perth. See why you should get a shade sail. Shade sails are widely used within Australia as they offer a great form of protection from the sun and can cool an area down by providing shade. If you are looking at getting a shade sail think of Sail City for a high quality custom shade sail in High Wycombe.